Dr. 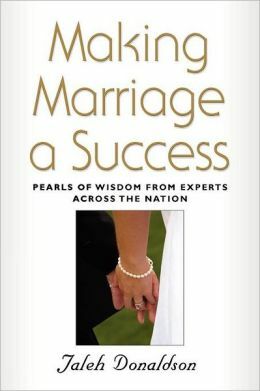 Chestnut is a contributor to Making Marriage a Success. Every marriage, even the strongest, encounters challenges. Are you prepared to face the storms that loom over the horizon? Don’t wait until they arrive – prepare well in advance by equipping yourself with expert knowledge. Making Marriage a Success supplies the information you need to bolster your marriage or get it back on track. Its dual purpose makes it twice as effective; first, it’s a timely collection of pearls of wisdom from not just one or two but dozens of the best psychotherapists and other relationship professionals across the nation. Equally important, it’s a directory of relationship experts, complete with websites, organized in a convenient state-by-state format. When your marriage needs support, help is at your fingertips with Making Marriage a Success! You can now purchase the book online on Amazon.com and Barnes & Noble. About the author: JALEH DONALDSON holds a Bachelor of Arts degree in Psychology, a Master of Science in Marriage and Family Counseling, a supervisory permit in early child development, and a writing certificate from the Institute of Children’s Literature. Jaleh has traveled around the world but has lived in California for most of her life. She currently works as a public school teacher and enjoys spending time with her husband and two young boys.